The Jebel Ali plant in the United Arab Emirates can produce 2.13 billion litres of water a day. Image via TIME / Spencer Lowell for TIME. The following text is an excerpt from the article ‘Look to Windward: The Case for Wind Powered Desalination’ by William Steel, published in WaterWorld. As a popular renewable energy, wind power has the potential to help lower the desalination carbon and energy footprint. Yet the coupling of the two industries, for direct wind powered desalination, has not progressed. Why? As a characteristically energy intensive industry desalination has, historically, relied heavily on fossil fuels. It is estimated that currently installed and operational desalination plants worldwide emit around 76 million tonnes of CO2 per year; an amount expected to grow to around 218 million tons by 2040, according to the Global Clean Water Desalination Alliance (GCWDA). Change, however, may be on the horizon. With the convergence of heightened calls for clean power production and the advent of technologically advanced renewable energy systems, the feasibility and rationale of powering desalination with clean energy has never been greater. 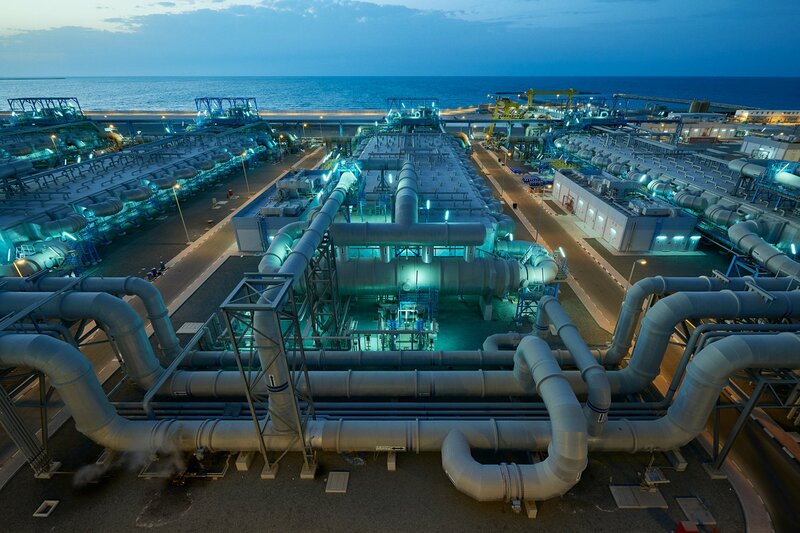 Desalination processes are powered predominantly by electricity; though a majority of large desalination plants in the Middle East Gulf do operate through thermal processes. Both electricity and heat, however, may be supplied through clean, renewable energy – dramatically lowering desalination operating costs. Racks of desalination membranes housed in pressure vessels. Of the methods of renewable energy production available, solar photovoltaics and wind power stand out as the most accessible means of powering desalination. Already the leading source of new renewable energy capacity, wind power is an especially promising route for decarbonising desalination. Precise economic advantages of wind powered desalination will invariably be project specific as wind turbine power generation is highly dependent on geographic location. However, innovations in the form of wind turbines designed for low wind speed operations are useful in the context of powering desalination — allowing for reliable energy production at wind speeds as low as 3 or 4m/s and available in many regions. For the full story, continue reading at Water & Wastewater International.